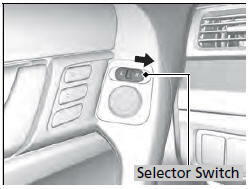 If activated, the passenger side door mirror automatically tilts downward when you put the shift lever in ; this improves close-in visibility on the passenger side of the vehicle when backing up. The mirror automatically returns to its original position when you shift out of . 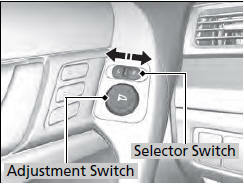 To activate this feature, turn the ignition switch to ON and slide the selector switch to the passenger’s side.